I've often wondered if that was a typo, or something else. He often gave his extra toys to charity, or dumped them down the cistern when he needed more space. 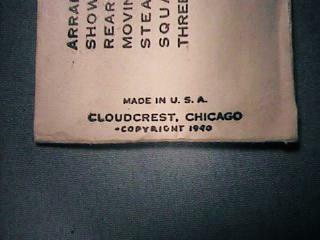 So he didn't have many of his older Cracker Jack toys, when he wrote Cloud Nine. 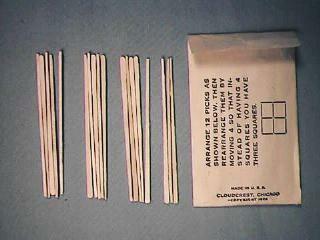 He may have just mis-remembered 21 toothpicks, or was dyslexic when typing. 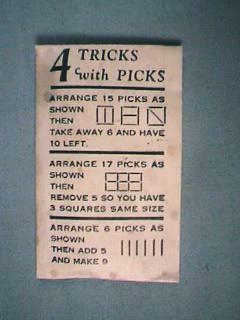 He did have another toothpick puzzle for Cracker Jack called "4 Tricks with Picks", I don't have that in my collection, but I believe it had 17 picks. But then, I could be mis-remembering it. Well, a picture (unphotoshopped) is worth a thousand words (unmisquoted). 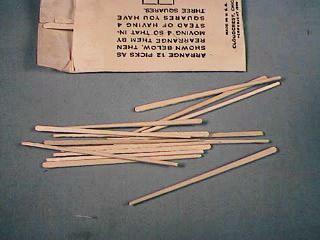 The last picture shows that the "stix" were indeed flat toothpicks - and there were at least 17 (in this case 18) in the package. Wait, I wasn't trying to make a case - so I don't rest it. . . . . . yet. Larry, thanks for the pics. I don't have the tooth pick version in my collection, but I do have the paper version. 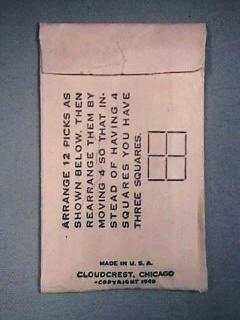 I don't know if the paper picks are a Cracker Jack prize, or if it was used with Cloud's mail away prizes. 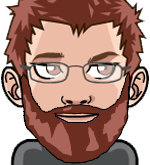 The paper version is slightly different, on one of the tricks. 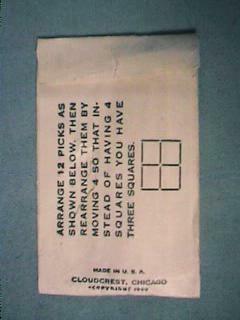 "Arrange 17 picks as shown then remove 5 so you have 3 squares same size." 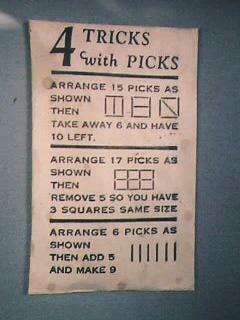 I was never happy with the solution to the paper pick version of the game. Now that I've seen the toothpick version of the game, and how elegant the answer is, I wonder if Cloud made a mistake in the paper version. Well, it's not exactly a smoking gun, but close to it. Here are some pictures of a similar prize bu C. Cloud.